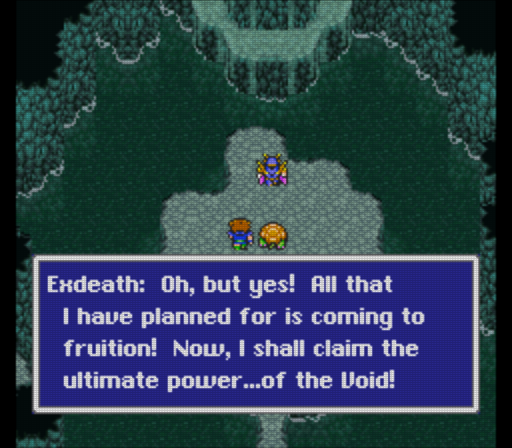 Final Fantasy V is a role playing game for the Super Nintendo. 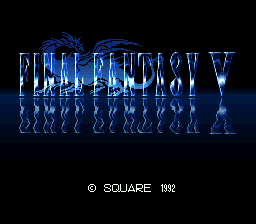 The game was released in the States as part of the Final Fantasy Anthology, complete with Ted Woolsey’s script that was done before the SNES Square translation was scrapped. The game is pretty straightforward Final Fantasy, except for the Job System that the characters use. You have a large selection of jobs, and there’s no penalty in switching from one job to another (unlike FFIII). Battles earn you points that go towards leveling up these jobs, which give you extra abilities. Legend of the Crystals is an attempt to modernize the now nearly-two-decade-old translation of Final Fantasy V done by the fine folks at RPGe (found here). The author has received permission from harmony7 and Barubary (two of the team). The changes are subtle and few. Also, the punctuation is altered. There are some misunderstandings in the previous review. The reviewer mentions how this patch does not use “the real Japanese names ‘Butz’ and ‘Cara’,” but those names are not “real.” Indeed, the name “Cara” was invented whole cloth for the original RPGe translation, and is not a valid translation of the Japanese name. 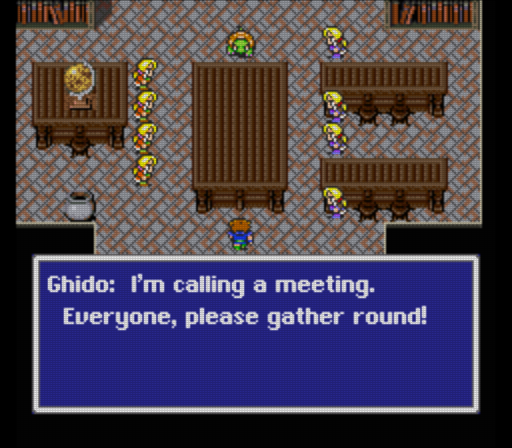 At the time the RPGe patch was released, only the literal phoneticization of the name, “Kururu,” was widely known, and RPGe changed it because they found it silly. “Krile,” however, is a valid translation, and was very likely what Square was going for all along. 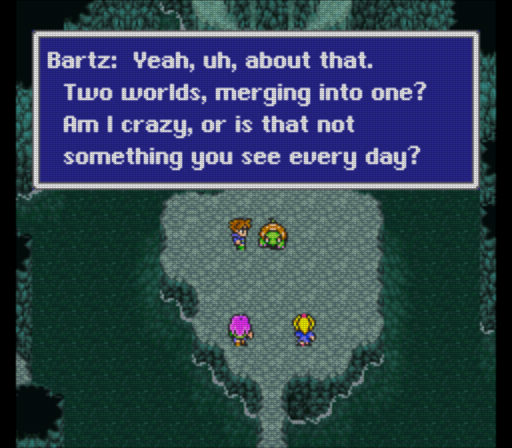 Butz/Bartz is a different matter: both are valid translations from the Japanese, neither being any more “correct” than the other. 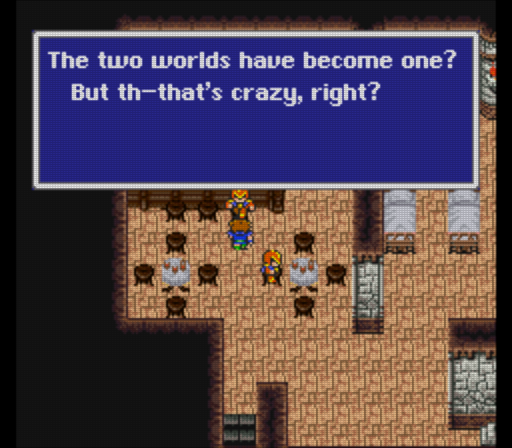 Early English-language material (prior to the first official English localization of the game with the PlayStation port) generally opted for “Butz,” but later on Square settled on “Bartz.” In any case, it’s not a question of accuracy, merely localization choice, and Spooniest has clearly settled on sticking more closely to the official Square Enix localization. Beyond that, this is a good, almost mandatory addition to the RPGe patch. It’s not perfect, and it maintains some of the changes mentioned in the earlier review (”Shoat” for “Carbuncle” being originally derived from the American Final Fantasy III). But it does an admirable job of sanding off the rougher edges of the RPGe translation while working within the aesthetic and space restrictions of the 16-bit game. In terms of a more complete and accurate translation, it’s not as good as the Game Boy Advance, mobile, or Steam releases, but if you’re feeling nostalgic, or just looking to experience the game in something closer to its original format, this is currently the way to go.